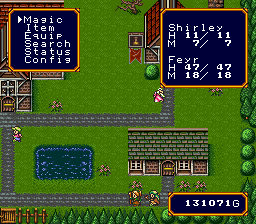 An average Rpg about a young man going to magic school to take after their wizard father. 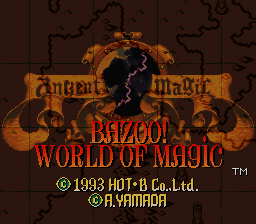 Ancient Magic is a fairly generic little RPG for the SNES by the much-maligned Hot-B. See if you can spot their advert for another of their products in the game! Despite its rather pedestrian roots, the game takes several surprising twists towards the end, and is generally worth sticking it out even if the wrap-up (or lack thereof) is a bit of a let down. As a note, there’s more game past “THE END.” Also as a note, do set your window speed to “fast” in the in-game options menus - it’ll improve your experience dramatically. 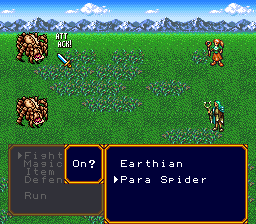 Very few of the spells and items have descriptive names. 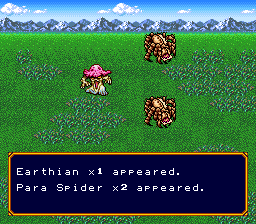 And, the game doesn’t give the descriptions any where. One item Goliath Tonic is a deceptive name. Goliath tonic should be the name for strength potion. Instead its the name for life restoration potion. Under what definition is an evil giant from the bible related to resurrection. Goliath is used to mean strength or size. 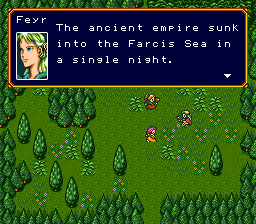 I think all translation in games without in game descriptions should be descriptive.